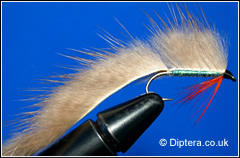 The Minkie can be used as a general purpose lure but is most effective when tied in Brown, grey or white and used in the fry season. The wing is highly mobile which makes this fly so effective when fry are around. It can be fished static on a long leader using a floating line or on an sinking line and retrieved at various rates of retrieve.